A collection of modules for SQL Server DBAs. It initially started out as ‘sqlmigration’, but has now grown into a collection of various commands that help automate DBA tasks and encourage best practices. Following that session I wrote a Powershell Script to gather information about the last used date for databases which I blogged about here and then a T-SQL script to take a final backup and create a SQL Agent Job to restore from that back up which I blogged about here The team have used this solution (updated to load the DBA Database and a report instead of using Excel) ever since and it proved invaluable when a read-only database was dropped and could quickly and easily be restored with no fuss. I was chatting with Chrissy LeMaire who founded DBATools b | t about this process and when she asked for contributions in the SQL Server Community Slack I offered my help and she suggested I write this command. I have learnt so much. I thoroughly enjoyed and highly recommend working on projects collaboratively to improve your skills. It is amazing to work with such incredible professional PowerShell people. The only thing I didn’t add was a LARGE RED POP UP SAYING ARE YOU SURE YOU WANT TO DROP THIS DATABASE but I considered it!! $sourceserver = New-Object Microsoft.SQLServer.Management.Smo.Server "ServerName"
$backup.BackupSetDescription = "Final Full Backup of $dbname Prior to Dropping"
Write-Output "Creating Agent Job Category $categoryname"
Write-Output "Created Agent Job Category $categoryname"
throw "FAILED : To Create Agent Job Category $categoryname - Aborting"
$job = New-Object Microsoft.SqlServer.Management.Smo.Agent.Job $jobServer, $jobname $job.Name = $jobname $job.OwnerLoginName = $jobowner $job.Description = "This job will restore the $dbname database using the final backup located at $filename"
$job.Description = "This job will restore the $dbname database using the final backup located at $filename"
You too can also become a contributor https://dbatools.io/join-us/ Come and write a command to make it easy for DBAs to (this bit is up to your imagination). 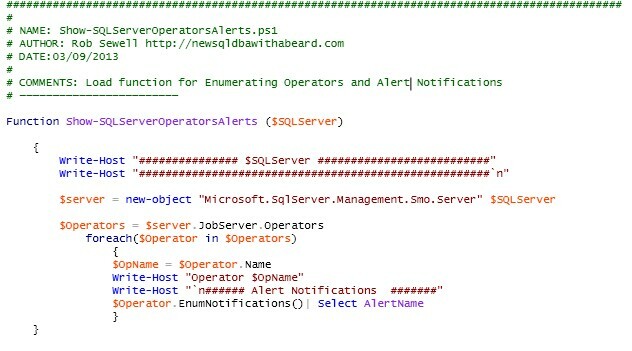 Alerting of issues across the SQL Server estate is important and recently I needed to audit the operators and the notifications that they were receiving. However this does not work as it does not perform the second enumerate. 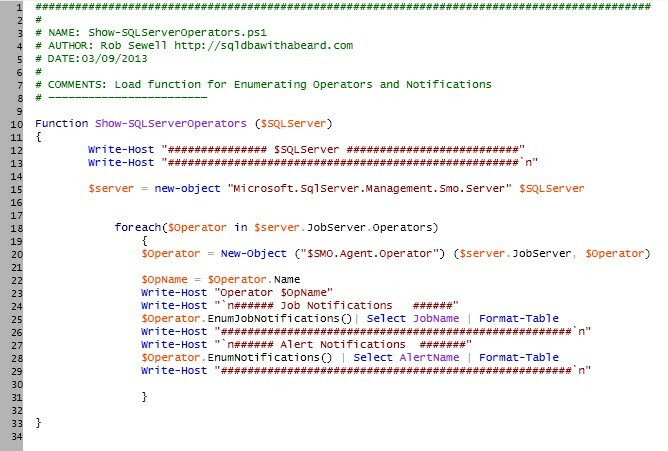 Try it yourself, switch round the EnumJobNotifications and EnumNotifications methods in that script and see what happens. Now the reports are coming out showing the correct number of lines but not displaying them. I spent a period of time on my Azure boxes trying to work a way around this. I set the outputs to both enums to a variable and noted that they are different type of objects. I tried to enumerate through each member of the array and display them but got too tired to finish but I had contacted my friend Stuart Moore Twitter | Blog who had a look and resolved it by simply piping the Enumerates to Format-Table. Thank you Stuart. Write-Output "`n###### Job Notifications ######"
Write-Output "`n###### Alert Notifications #######"